Birth of Eaweard Muybridge (1830-1904), photographer known for his pioneering work in photographic studies of motion. Canut (silkworkers’) revolt: Faced with employers conspiring together to reduce their wages, coupled with arrests of workers who try to resist, thousands of silkworkers in Lyon, France, rebel. The army moves in and opens fire on an unarmed crowd. In response, barricades are thrown up, workers seize weapons from the armouries, and street fighting begins. 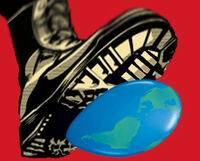 The uprising continues until April 15, when the army succeeds in imposing order, which it does by killing hundreds of workers and imprisoning more than 10,000 others. 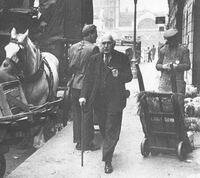 Birth of Victor Gollancz (1893-1967), British publisher, author, and socialist; one of the founders of the Left Book Club in Britain. 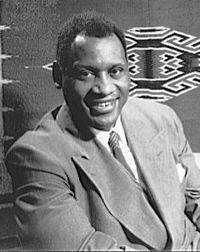 Birth of Paul Robeson (1898-1976), African-American singer, actor, athlete, socialist. 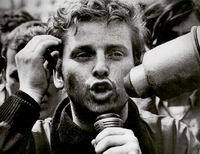 Birth of Daniel Cohn-Bendit, radical activist and Green politician. The ‘Journey of Reconciliation’. 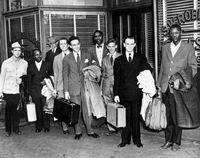 Sixteen men, eight black and eight white members of the Congress for Racial Equality, begin a journey on interstate buses across the U.S. South to challenge segregation. Despite a 1946 Supreme Court ruling saying that segregated seating on interstate buses was illegal, southern states continued to impose the practice. The participants in the Journey of Reconciliation encounter hostility as they sit together, and several are arrested and sentenced to serve on a chain gang. Deir Yassin massacre: Zionist militias attack the Palestinian village of Deir Yassin and kill more than 100 villagers, including women and children. El Bogotazo: Riots break out in Bogota, Colombia, after the assassination of the Liberal presidential candidate Jorge Eliécer Gaitán. The riots leave 3,000 to 5,000 people dead. The fighting marks the beginning of a ten-year period of civil war known as La Violencia, in which more than 200,000 die.